As for civil war, only one side is armed. What’s Next For Venezuela? El preso político venezolano Leopoldo López, de 46 años, ha salido de la cárcel de Ramo Verde. López, detenido desde febrero de 2014, ha pasado a arresto domiciliario y se encuentra en su casa desde la madrugada de este sábado, según ha confirmado a EL PAÍS el español Javier Cremades, uno de sus abogados. El opositor venezolano ha vuelto a su domicilio sin aceptar ninguna condición para su regreso, informa Cremades. La nueva medida —que en Venezuela se conoce como “casa por cárcel”— coincide con tres meses de intensísimas protestas contra el régimen de Nicolás Maduro en las que han muerto 89 personas. Venezuelan political prisoner Leopoldo López, age 46, has come out of Ramo Verde prison . López, jailed since February 2014, is now under house arrest at his home, where he arrived at dawn on Saturday, as his Spanish lawyer Javier Cremades confirmed to EL PAÍS. 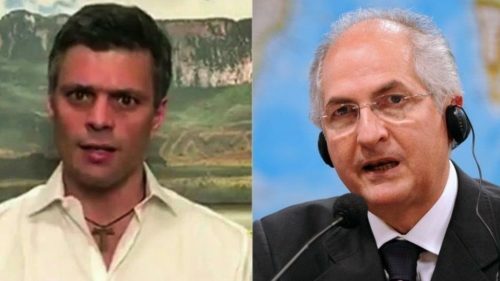 The Venezuelan opposition leader returned home without having accepted any conditions for his release, according to Cremades. This new measure – known in Venezuela as “house for jail” – coincides with three months of very intense protests against Nicolás Maduro’s regime which left 89 dead. After more than 1235 days in solitary confinement in a military prison LEOPOLDO LOPEZ IS RELEASED AND IS NOW UNDER HOUSE ARREST. 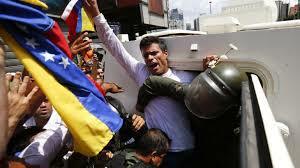 A heartfelt thank you to those who have cared, and who have kept the pressure on the Venezuelan dictatorship. This is a good day, a very good day. Here’s Halvorssen’s Human Rights Foundation press release. WaPo now has the story. Don’t miss Affinity Magazine’s post. Leopoldo López has been held in solitary confinement for 71 days, and has not been allowed to speak to his lawyers for 81 days. She was not allowed to see him. Earlier this month, the judge who upheld López’s jail sentence was shot dead during a robbery. If you are living in opposition areas your Internet and light and water services have noticeably decreased in “quality”, as if they ever had any in the first place. Apparently Maduro Is Rapidly Running Out Of Friends; the question is, who comes after him? Jailed opposition Venezuelan politician Leopoldo Lopez is well and is urging street demonstrators to keep up massive anti-government protests, his wife said on Sunday after her first visit with the former presidential hopeful in over a month, putting to rest rumors of his ill health. The regime should, but won’t, allow López to be seen by the general public. El Nuevo Herald reports that Lilian Tintori, López’s wife, was allowed entrance at Ramo Verde prison. Rumors persist on López’s condition. Following rumours that jailed Venezuelan opposition politician Leopoldo Lopez had been moved from his cell to a military hospital, a government lawmaker showed a “proof of life” video of him in his cell. He had been reported dead earlier. On Wednesday night, news spread on social media that López’s condition at the prison had deteriorated so much that he had been transferred to a military hospital. Shortly after those rumors began, National Assembly minority leader and suspected drug kingpin Diosdado Cabello, who was hosting a live state television program at the time, announced that López – who he referred to as “the Ramo Verde monster” – was healthy and published a bizarre video of a man claiming to be López confirming his good health. 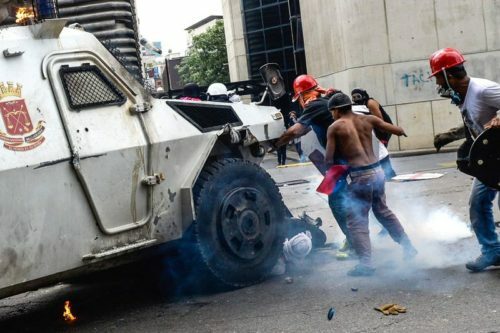 As of the writing of this post, rumors persist (link in Spanish) that López died of abdominal trauma and hemorrhaging on April 30th following a beating by two National Guard members for refusing to publicly demand that the opposition end all street demonstrations. The author of that article alleges that López body was cremated, and that prison officials will claim he escaped. If López is alive, the Caracas dictatorship should produce him. Lopez was last seen in public on February 18, 2014. Listed as a Power Line pick. Thank you! The newspaper El Nacional published videos Wednesday showing the vehicle backing up as a gasoline bomb burst on its windshield. Crowds raced toward the vehicle and then suddenly fled as it advanced, and masked soldiers battled protesters in a chaotic melee. Rocks, bottles, shots and tear gas filled the air. One person was confirmed dead in Caracas. Foreign minister Delcy Rodríguez blames foreign governments and biased media coverage for the country’s unrest, and said the OAS is “fanning international hysteria.” At least she didn’t blame the Russians, considering she was on RT. It’s 2017, But Venezuela Looks Set To Be Choosing Communism. As long-time readers of this blog know, they chose communism in 2009 when Hugo Chávez was kept in office after declaring himself a Marxist. Steve Hanke and María Belén Wu have a Survey of Venezuelan Public Opinion on the Replacement of Either the Bolivar with the U.S.Dollar or the Central Bank of Venezuela with a Currency Board. To put PDVSA’s depletion rate into perspective, let’s compare it to Exxon’s. At the end of 2015, Exxon’s depletion rate was 8.15% — which is comparable to most of the world’s major oil companies. That rate implies Exxon’s median time to extraction (and sale) for a barrel of oil is 8.2 years. That’s 190 years earlier than PDVSA would realize revenue from selling a barrel of oil. Given the rate at which Exxon is depleting its reserves, they are worth something. Indeed, if we discount at 10%, Exxon’s reserves are worth 46% of the well-head value. Not zero, as is the case for PDVSA. Workers at Venezuelan steelmaker Sidor are planting sunflowers and vegetables on company premises to ease a national food deficit as steel output has almost ground to a halt nine years after the company was taken over by the government. That’s according to the recent 2017 Index of Economic Freedom ranking, which places Venezuela in 179th position — next to North Korea, which occupies the 180th. Published by the Heritage Foundation, the Economic Freedom report measures such things as trade freedom, business freedom, investment freedom, and the degree of property rights protection in 180 countries actually ranked. Venezuela is also catching up with North Korea in corruption, while it is well ahead in inflation, which runs at 800%. Peru’s president recalls envoy over attacks by Venezuela, after Nicolás Maduro referred to Peruvian president Pedro Pablo Kuczynski as a ‘coward’ and a ‘dog’ subservient to US, following PPK’s White House visit – the first by a Latin American president. How long is it going to take to crawl out of this hole? The WSJ editorial board Trump’s Best Tweet. He speaks up for freedom in Venezuela, unlike his predecessor. Taking no chances of anyone noticing, the Maduro government on Wednesday shut down CNN En Español, the nation’s last remaining source of independent news. But President Trump noticed. That tweet demanding the release of Leopoldo López belies Mr. Trump’s reputation for being soft on authoritarian leaders. On Monday the Trump Treasury Department put Venezuelan Vice President Tareck El Aissami on its sanctions list for allegedly aiding drug traffickers.